My first car, a hand-me-down 63 Ford Custom, was as honest as the day is long. The simplicity of its small block V8, carbureted fuel delivery, and three-on-the tree shifter hid nothing. 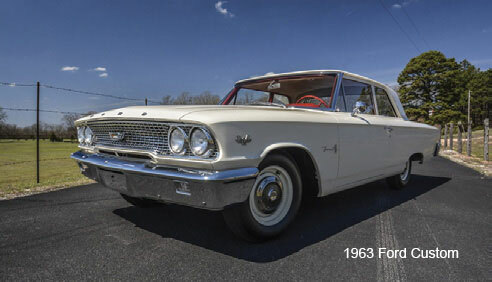 Pressing the accelerator left no doubt as to the cost of its modest acceleration in terms of poor gas mileage and smelly tailpipe emissions, but teenage boys of the late 60s didn’t much care about mileage or air pollution. The seasoned automotive engineers of that era could not have dreamt of the refined power, high mileage and low pollution that their young counterparts would deliver forty-five years later. Nor could they have dreamt that the most costly automotive scandal in the history of the industry would stem from technology so advanced that vehicles could shapeshift on the fly from diminutive socially responsible performers to powerful gas guzzling polluters. Modern cars are consummate shapeshifters. By that I mean that their performance characteristics are often radically reconfigured in real time by on-board software, and that is a good thing. Performance shapeshifting is how they deliver power precisely when needed, yet avoid excessive fuel usage or emissions over their wider range of operating circumstances. Nonetheless, shapeshifting can be abused. Like the politician who tries to be all things to all people and ends up a liar, designers striving to deliver vehicles that are all things to all people can be led into veiling their vehicle’s bad manners with shapeshifting. In an effort to deliver a great driving experience to their customers, they can use on board technology to sense when the vehicle was undergoing performance scrutiny in a laboratory versus driving under real world conditions. The vehicle’s array of processors, sensors and actuators, in concert with its software, can be programmed to shapeshift performance toward observer expectations, namely: low pollution and modest acceleration in the lab but high pollution with great acceleration on the road. 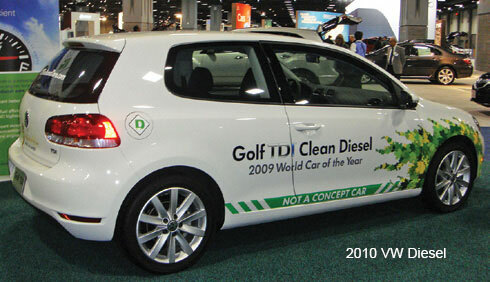 The recent VW diesel scandal is an example. I am, of course, greatly oversimplifying the complexity (and difficulty) of the engineering involved in shapeshifting of any kind. My high level description is meant to give a sense as to what’s beneath the cryptic “defeat device” term so popular in the media. There is no singular defeat device responsible. Wayward performance shapeshifting is the issue. My industry inspects vehicles for emissions and safety. Upon hearing about the scandal for the first time, a friend from outside the industry asked me, “Don’t they have technology to catch this sort of thing earlier?” The short answer is, “Yes”; however, you need millions of on road emissions measurements to do so. The technology used in laboratories during the Federal Test Procedure (FTP) type approval of new make/model carlines won’t do the trick. Type approval involves placing a vehicle on a treadmill-like device called a dynamometer (aka dyne). The dyne simulates a road surface via spinning rollers while offering varying resistance to the engine’s labor. During the process, exhaust is captured and analyzed with highly accurate (and expensive) instruments. There is a flaw in the process in that modern vehicles have a variety of ways to detect when they are being exercised on treadmills. They can monitor their own accelerometers, air flow sensors, temperature sensors, wheel rotation, steering use, and GPS location to calculate that the vehicle is not on a real road, and they can adjust their performance to pass the test. Once on the road, they shapeshift. So why not take the lab equipment out on the road? 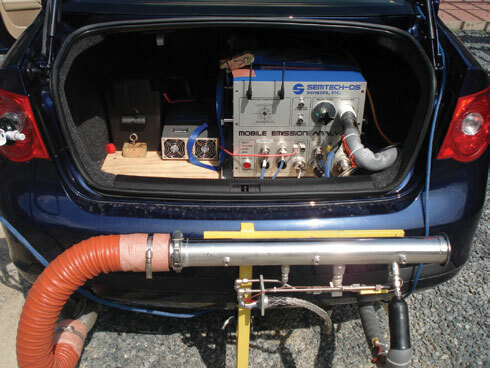 Scaled down versions of laboratory equipment are, in fact, available and can be installed in or on the rear of vehicles to enable on road testing; however, application of these ‘Portable Emissions Measurement Systems’ (PEMS) have practical limitations. In-use studies of vehicle emissions using PEMS require getting agreement from a statistically significant sampling of vehicle owners for each of the different make/models on the road. The owner must willingly surrender their vehicle for several days while government representatives mount bulky instrumentation on it and then drive it on a variety of roads. To ensure long term compliance, this would have to be done several times during a vehicle’s life. That is a truly expensive and impractical proposition given the thousands of make/models on the road! Luckily, there is less intrusive technology that can flag likely wayward shapeshifter carlines, thereby funneling only the bad actors into further testing regimes such as PEMS. Remote Sensing Devices (RSDs) are able to measure emissions of vehicles passing by on public roads under normal use. The technology directs low energy beams of infrared and ultraviolet light across the road surface at tailpipe level. These beams are then reflected back to highly sensitive detectors after they pass through the exhaust plums of passing vehicles. RSDs are often placed on freeway entry ramps where vehicles accelerate. This ensures the engines of passing cars are under sufficient load to reveal pollution if it is occurring. Vehicle speed and acceleration is also measured to qualify the emissions measurement. Additionally, a digital image of the license plate is captured and queried against the Motor Vehicle Department database to determine the make and model of the measured vehicle. Further analysis of the RSD database hints that wayward shapeshifting is occuring in other carlines, and it can vary by model year. This implies performance varies with software versions. Measurement technology has, in fact, kept up with the shapeshifting capabilities of modern vehicles. Success requires collecting enough of and the right kind of measurements—i.e. on road. From there, it’s a matter of analysing the data to spot wayward shapeshifters.